Don’t get your hopes up. I haven’t sewn any yet. Well, besides my high waisted OhhhLulu knickers. Those are fun. What I’m really wanting to sew are bras and I’m actually forming the perfect bra in my head. I know that can be dangerous because even the perfect bra might end up flawed, either in fit or constructions as this will be my first attempt at making my own bras. 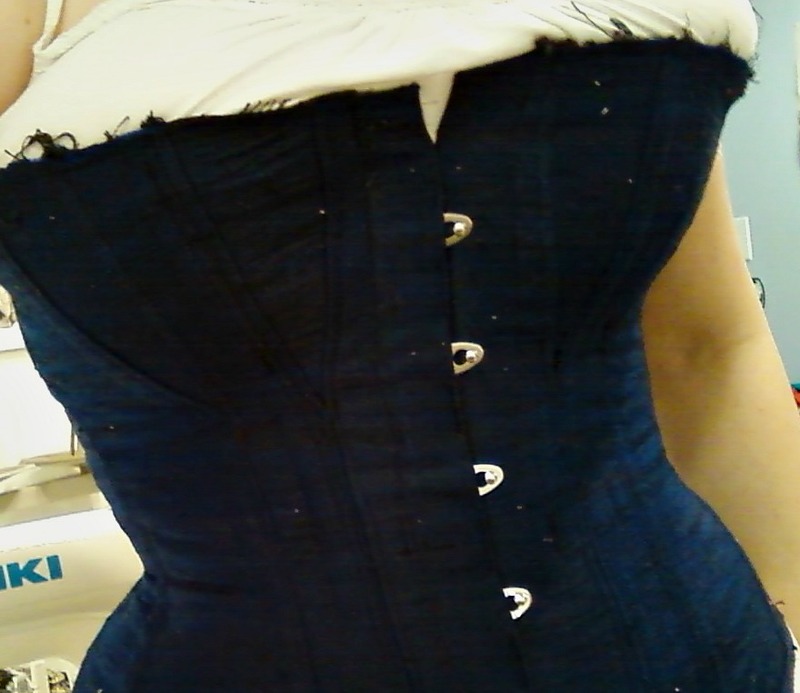 But then I remember that I’ve sewn corsets. If I can do a corset, I can do a bra, right? Actually, my latest Victorian corset is what has me thinking about bras. When I fall in love with a bra design online, I tend to discard the idea by thinking that it probably won’t fit me right. In some cases, that’s true, but most of the bras I’m looking at are for my size so I don’t know what’s wrong with me. Years of disappointment, probably. Believe it or not, even some of the bras made for larger busts won’t fit me. You know how I go on and on (or so it seems) about cutting a smaller back? Part of what got me thinking this way was my bra band size. I buy a 34 back but after a couple of weeks, sometimes just a few days, I have to alter the band to about a 32 band. The bands stretch, yes, but I also don’t think I’m buying the right size to begin with. I could buy all my bras online but I’m still unsure what size to get from each company since they all differ and I’m picky about how my bra will fit. As you might have found in your own bra hunting, finding a smaller band and a larger cup is tricky. Not as tricky as it used to be, thanks to several bra-makers, but tricky none the less. Back to the lines of the Victorian corset. The gores provide the support and the lift and while I don’t want to look like I do when I wear this corset, it taught me a lot about how what gores can do for the bust. The picture below, an in progress pic I snapped during the mad rush of making this corset, shows you how the gores are working. They’re pushing my bust up into the Victorian shape. The coutil (a very closely woven herringbone) is doing a lot of the work. Now let me show you the bras that have been beckoning to me. First, the Curvy Kate Tease Me Bra. See the similarities with the Victorian corset? It’s those gores. The Victorian corset is a lot more exaggerated but I can see how I can make this bra. Don’t ask me why but I really want to make a long line bra, too. Again, you can see the gores I’m liking. What patterns have I found? I stumbled on this Ralph Pink Pattern, RP021. This next set of patterns is for use with the PatternMaker software. All you need is the basic program to input your measurements and print out a customized pattern. You still need to muslin it and tweak but it seems like such a great starting point. Not sure what your bra size is? Getting fitted at a store can be a good starting point but just remember that they are still sales people and they want to sell you something. I’ve been to several Nordstroms and they always argue with me over band size. Why? Well, if I go by the snug fitting 32 back I like, I’d need a 32HH, not an easy size to find there, which means no sale. Check out this size comparison chart. You’ll see how the different bra sizes are categorized by volume, not by cup. Before I had kids, I wore a 34DD, aka a 34E and sometimes I even wore a 36E. I honestly don’t think I was wearing the correct size since I was always pulling my band down. In looking at the size comparison chart, I probably would’ve been more comfortable in one of the sister sizes (remember, we’re talking volume here) 32F or 30FF, also really hard to find sizes. Bra fitting is such a personal thing. Some people prefer a looser band. No harm in that, so long as you’re properly supported by the band. The straps should not be doing all the work. Some people like push-up bras, some like a more low hanging look. I’m not here to judge. I consider bras as part of my daily costume. Whether modern, historical or something in between, undergarments play a role and I’m ready to have more bras. How many bras do you have? Do like bra shopping? Is it tricky for you, too? I’m so determined to make bras this year. Anyone else hoping to cross bra-making off their to-do list? I don’t know if I’ll ever get to sewing them myself–I got a fitting done so I could get a strapless bra that would actually stay up all day for the wedding, and was told I’m a 30D. (I’ve generally been wearing a 34C, since it’s the smallest band size I can get in stores, and it’s mostly worked ok.) The size difference, if true, was rather surprising. But my main hangup with trying to sew them is the seam across the cups, because I’m honestly worried that they would show through all of my t-shirts and other knit stuff. You can totally sew your own bras! Regardless of the pattern you want to use, my book will be out in a few weeks and can help you get the right fit. I also included my construction techniques so you will get professional looking results. Once you sew your own, you will not go back to buying ready-to-wear! I’m so looking forward to your book Orange-Lingerie! Oh Leila I’m so happy you found Ralph! I have been following him for about 3 years now and I just lovelovelove his work! Oh, as for Bras, I actually am very lucky that the Target brand Gilligan & O’Malley fits me great in the 36 D. I usually wear shelf bra tanks, though, because I’m always cold. I’d love to see how your custom bra turns out, because it’s one of those things I have always wanted to learn! Check out the new pattern from Bramaker’s Supply, The Shelly. It is similar to one of my favorite Elomi bras. If you are looking for small band/large cup bras in RTW, check out Elomi if you haven’t already. They have a new long line slated to come out soon that is gorgeous. I’ve got the Shelly Pattern on my to do soon list! I wonder what the cost of sewing your own bras would look like, by time you incorporate a muslin (would that include an underwire, etc.?) and a final product. I’m a 34G, so I know just how exorbitant good bras can be. I have no idea how much all the specialized bits that go into making a good bra would cost, though. Your comment has inspired me to do a comparison of cost to make a bra and the kind of bras we buy. Or, really, I’d have to see how much a custom-made bra goes for and compare to that since that’s more like what I’m doing. I’m sure after seeing what a custom made bra costs, I’ll look differently at the ones I buy. haha. I’ve had so many bras discontinued and new bra companies emerge that I’ve only bought the same bra maybe 3 times in my life. Another annoyance. I downloaded a Ralph Pink pattern & it didn’t have a test square to check that it printed out correctly. While it did print it at 100%, it seemed as if everything was waaaay too small. Ended up not using it & drafting my own bra instead. I think you’ve got an advantage with sewing your own corsets. The biggest problems I’ve found sewing bras are fit. I’ve tried several bra patterns and I think I’ve finally found a pattern that works for my body. It took four patterns and numerous muslins. The other problem is support from the underwires. I don’t know where the bra manufactures are buying their underwires but I haven’t found right pair for me yet. I’m not giving up. Plenty of women in Europe are sewing their bras and they look beautiful. If you google bra sew along, you should find a few bloggers and their beautiul images. Good luck! That’s good to hear that the reality of bra making will just take extra time. I like to know what I might expect. So, several patterns and many muslins. I can do that. I did see a bra sew along at Cloth Habit. I saved all the posts and I’ll be doing some reading. Thanks! I honestly think that most woman are wearing the wrong size bra. When I moved here to Merida, just about the only size you could buy was a 36B. So everyone was wearing the wrong size bra and it was obvious. Now you can actually find a range of sizes. When I was overweight I had an easier time buying bras. I’d stock up when I went north or have people bring me down some. Now that I am closer to my ideal weight, I probably wear a 30 G (or larger cup) which doesn’t exsist where I live.I decided to make a bra that actually fit. Then I found a solution that works for me. What I’ve taken to doing is buying a well fitting 36DD. What I mean is that the cups fit correctly. 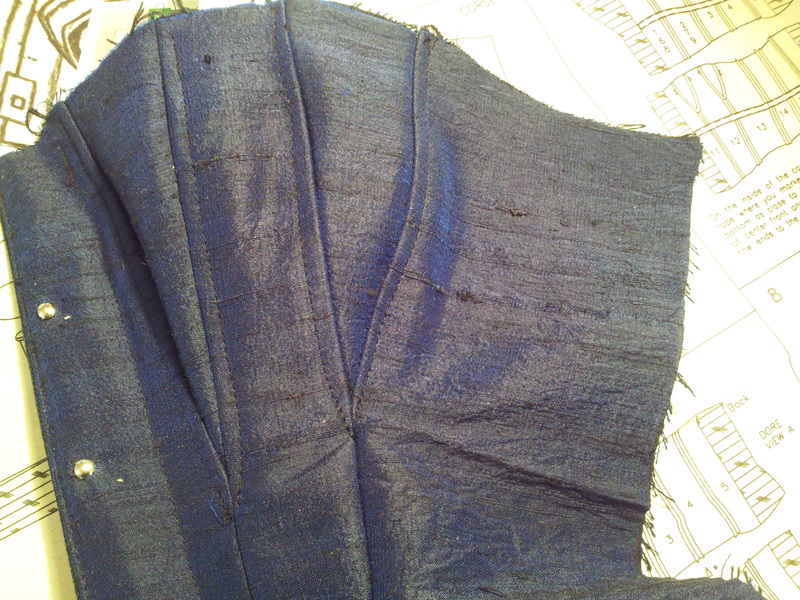 Then I use my seam ripper to undo the straps and the back fastener. I cut the back of the bra off to fit my small ribcage. Reapply the back fastener and the straps. As an added bonus the straps don’t slip off my narrow shoulders now. I have also bought some 38D bras and done the same but the 36DD is the best for me because of the spacing in the front. Not all bras fit the same of course. I keep toying with the idea of making the perfect bra but this solution is working for now. My main problem is that I either have to mail order components (and hope that they get here) or canibalize an old bra. I know that I am rambling on. What I wanted to say, I totally understand your frustration. Good luck on the bra making there is lots of information out there. Theresa, You can always ramble on my blog. 🙂 You’ve got a great fix! Thanks for the moral support. I admire your adventurousness! I don’t think I would attempt to make a bra. I’m lazy and would rather buy one but I’m not fond of shopping for them. They’re not cheap and I have the opposite issue in terms of cup size – I’m at the other end if the scale – A.
I’ll be looking to a couple of bra makers for some serious hand holding. I’m hoping I can do this but I’m assured I can. 🙂 The search for a comfortable, well fitting size is annoying, no matter what size. I have the opposite problem (small bust), which also makes it really difficult to find bras that fit. The few that I’ve found are always 32A, but many times even those with that label don’t fit (usually too big in the cup). I know that I’m buying the correct size – it’s just that the standards between brands seem to be all over the map. I feel your pain with the online shopping – if I can’t easily find my size in person in the store, why would online be different or less frustrating? I really dislike bra alterations/making because of all the ones I’ve had to mess with on the job, so I’ve just never been motivated to make my own. The only type I’ve pondered making is a bullet bra (because they just plain don’t make them in my size) or some other period specific costume type. 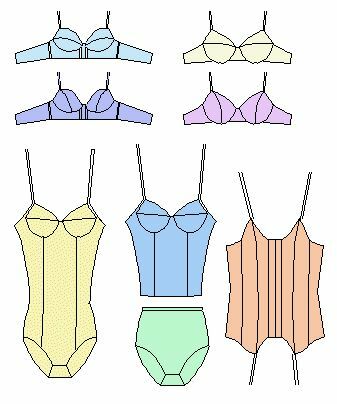 If you are small busted you should look at some 1920’s bra/undies patterns. They are definatly suit to those that don’t have full fronts. Thanks Laurie. I feel like it’s something I at least want to try. Good luck on yours, too. I would never – ever – make my own bras. I like the lacy pretty ones, and they look horrible under T-shirt because the seams and lace “silhouette” through the fabric. I know it would be considerably cheaper to make mine instead of buy them, but if I source it right, then I can get great deals on the French and English brands I love and it saves me the hassle of fitting and making my own. Heck! Getting a bra that fits perfectly when I don’t have to make it is an arduous journey in itself. I am not an easy fit and I do have to go to specialty shops, and I’m so happy to put the girls into the “expert’s” hands. I usually walk away with one bra, but make notes of the others that fit properly and that I like, and then I stalk the internet for the deals. That all said, I would definitely make a corset…..
Well, you’re shopping the smart way. And I’m not sure how much cheaper it would be. I guess I’d have to do a comparison. I don’t think I would ever make my own – I know how many styles I have to try on to get a good fit and this is after having a proper fitting so I know I’m trying the right size! We are pretty lucky in the UK to have a shop called Bravissimo. They do from band size 28 and from cup size D to L. Since I started buying there, I have never gone anywhere else. I usually find one style I like and buy it in every colour. Having said that, I can see the appeal of sewing your own as you would have the freedom to tweak it to your exact personal preference. And I would imagine that having sewn corsets would give you a bit of a head start. I hear ya sister. You are same size as me and it is such a hassle to find a supportive, well fitting, comfortable and not ugly bra. Oh and anything over a UK DD costs a fortune. My most comfy bra is from M&S and its very similar to 1940s type bra. I really can’t stand underwires -so uncomfortable – but find I need them. I was wondering how to combine the best of corset and bra design to make a proper supportive foundation. the only problem is you’d need different shaped bras for different tops/dresses. I’m thinking the same thing. I want to combine corset stuff I know with bra design. It’ll probably turn into something retro. haha! And you’re right about needing more than one style for different outfits. I really would like a plunge that actually fits. I’ve tried on about 3 only and basically concluded that they don’t work for me but I’ve seen women with my same size or larger cups and smaller bands, wearing them so I know it’s possible.